Good Morning! Today is my last post for the Twisted Tuesday design team. I have decided to step down and I wanted to take a moment to say thank you to Melina and the other DT members for having me. It was truly a pleasure and I had such a great time visiting new blogs and leaving comments for everyone! Melina, I wish you the best with your Twisted Tuesday challenge blog! This week's Twisted Tuesday challenge needs be a tag or have a tag on it and the twist is to show something that makes you smile. 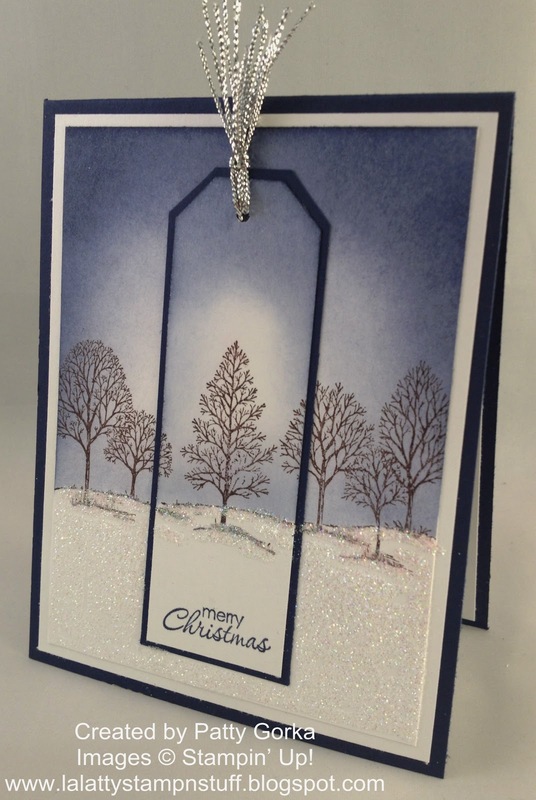 It can be a favorite stamp, embellishments, something crafty you received as a gift, etc. Be sure to post what it is that makes you smile. What makes me smile...?? 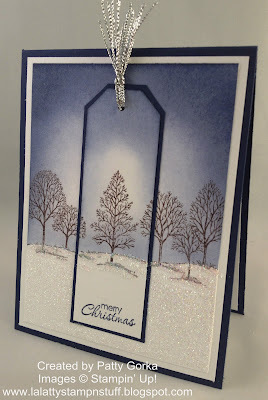 Well, I decided to use one of my very favorite stamp sets, Lovely As a Tree and I just love a fresh coat of snow and how pretty it makes everything look so I decided that my card needed to have lots of snow. Now if we'd only get some snow here for Christmas! I stamped the tree image onto my background and then again onto my tag. I masked off the snowy areas so that they would remain white and I sponged my background using night of navy ink and I sponged heavier around the edges and lighter towards the center. I made the tag by cutting a strip of card stock and inserting the top portion through my large tag punch and simply punched to top design. My night of navy layer was cut 1/8" larger and since I don't have a tag punch that's 1/8" larger I simply trimmed the top design by hand. Then I punched a hole at the top of my tag and I threaded some silver cording through and tied it off. You could easily use ribbon here instead. And what's a snowy card without any glitter, right? So I decided to add lots of glitter! I simply swiped my 2 way glue pen all over the snow and sprinkled dazzling diamonds all over....easy peasy! Well, I'm off to bake some Christmas cookies! Thank you so much for stopping by! Have a great day! Patty, this card is amazing looking and in creativity. I will miss seeing your challenge cards. Great job this round! Absolutely love this project and it surely made me smile. A big one in fact. Love the haloing of the sponging and the layer of the tag over top. I think I'd be tempted to Dotto the tag on so it could be removed and used as a bookmark by the recipient. Although the books might not appreciate the glitter! LOL. Thanks Patty for sharing this and the details on how it was made. It's going into the CASE file for sure. I just love this card! The eye appeal draws me in. Ohhhhh Patty this is so beautiful! Merry Christmas to you and your family! Patty, I do think this is one of my favorites of all the cards you've made and you've made a lot of fantasic ones! Lovely As a Tree is one of my favorite stamp sets and the way you used the tag is ingenious!